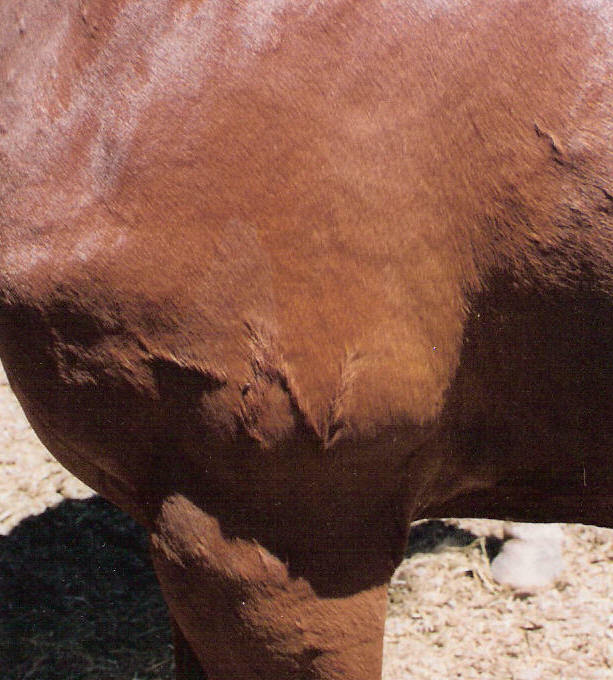 Mustangs are freeze branded on the left neck by the BLM after they are captured. 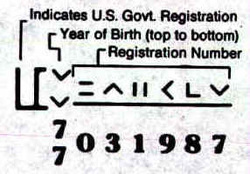 Details such as age and registration number can be deciphered from the brand. The registration numbers for mustang brands fall into these number ranges depending on the state where the horse was gathered. Here are telephone numbers for BLM offices with local jurisdiction. 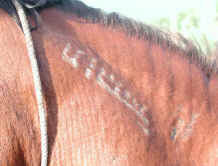 Tattoo on a thoroughbred horse. 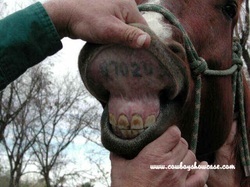 All race horses in the United States are required to have lip tattoos for identification. That includes thoroughbreds, quarter horses, standard breds, appaloosas, Arabians and mules. 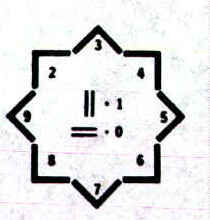 The tattoos vary by breed. This is a permanent manner of identification, however not easily seen. Click here for a	Good video on how to read a lip tattoo. 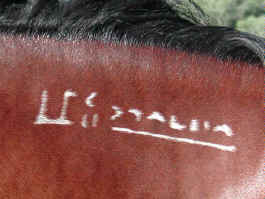 Standard bred tattoos can be researched at	http://www.ustrotting.com/ They consist of a letter and three or four numbers. http://www.arabdatasource.com/ has a one day fee, if you are not a member, for research on brands and tattoos. "This is the story of my Brand. I wish I had a story of some epic brand that has been pasted down from my grandfathers but my family has never been in ranching or even farming. There is no history in my brand, at least not yet. I grew up in south Texas and I always wanted to own a ranch and spend time cowboying. The closest I got was building fence for a local guy who had cattle, and raising pigs for the FFA. I started marking my stuff with my initials ZLD or ZD like a brand sometime around high school it was on my books and back pack, even on my shoes. At some point I was putting a Z D on something and the letters ended up offset and connected I continued the lower line of the Z through the D and it formed an L, the Z hanging D was born. Since that time it has become my symbol, I have it registered in my county and I put it on anything I can. 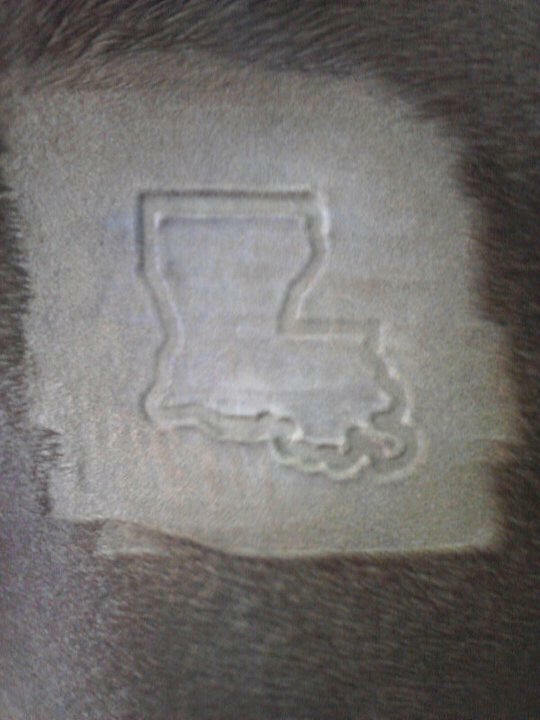 One year for my birthday my Mother had a fire brand made for me, and last year I had a freeze brand made for my horses. I don’t know what it is about brands but having mine lets me feel connected to a simpler time when all you needed was a rope and an iron to make a living. The earliest record we have of the Shield H brand is a Bill of Sale showing that William H. Clifton, Jr. of Hat Creek, County of Niobrara and State of Wyoming, received payment of $1.00. On this date of March 20, 1954, the brand was sold, transferred, and delivered to John W. Bryant of Hat Creek, County of Niobrara and State of Wyoming. We also have the original Brand Certificate from the State of Wyoming, Wyoming Livestock and Sanitary Board. On March 30, 1954, the Shield H brand was recorded for John W. Bryant, Hat Creek, Niobrara and recorded in Bill of Sale Record Book 18 on page 141 by then Executive Officer, G.H. Good. We have records of the Shield H brand being renewed on the following dates: January 10, 1956 for a $5.00 fee by John W. Bryant, Winchester Bay, OR September 8, 1965 for a $5.00 fee by John W. Bryant, Douglas, WY March 24, 1976 for a $5.00 fee by John W. Bryant, Riverton, WY March 17, 1986 for a $25.00 fee by John W. Bryant, Riverton, WY A letter dated April 11, 1979 from the Wyoming Livestock Brand Board shows that the Shield H brand was first recorded in their office on August 10, 1917. In this letter, the Wyoming Livestock Brand Board indicated that they had received a request to sell the Shield H brand from Mr. Bryant. A Bill of Sale dated May 20, 1994 shows that Steve Husted of Riverton, County of Fremont, and State of Wyoming purchased the Shield H brand. The location of our brand on both cattle and horses is on the left hip. 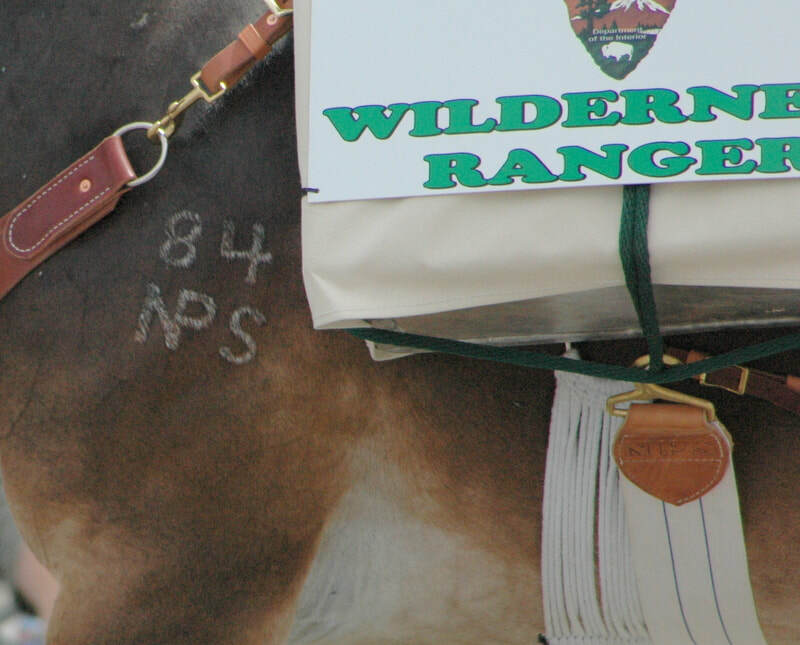 We carefully freeze brand our horses, ensuring a clean, easy to read brand. 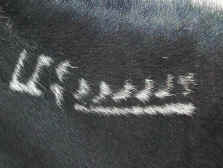 Our registered black angus cattle are hot branded, also easy to locate and read. The Shield H brand has a long history, and we intend to keep it prominent in our livestock and their offspring.